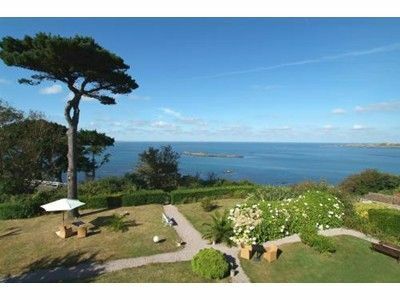 Hotel and restaurant located near the seafront in Perros-Guirec, in Brittany on the Côtes d'Armor coast of France. Charming hotel on the beautiful pink granite coast. Excellent facilities and dining. Tennis courts and beautiful gardens. Near beach. Our Hotel has comfortable double and single rooms. We have a restaurant with grand bay windows overlooking the ocean which serves local produce. Outside our Hotel we have private parking, leisure garden and private tennis courts. Our Hotel is located in Brittany at Perros Guirec in the Côtes d'Armor. For more information or to book Hostellerie Les Feux Des Iles Hotel on the coast of Brittany, please click on the 'Visit our Website' or 'View Availability' links above.We hope you enjoy your visit to Perros-Guirec, in Cotes-D'Armor. Please see the map below for our location and links to local attractions and things to do in the area. Located in Perros Guirec in the Côtes d'Armor.